We’ve always had a time trying to find shoes to fit TBG – he wears a size 15 in the US. Here in the UAE, it’s like a size 50, I think. When you go in the stores here and ask for mens shoes in a size 50, the clerk’s eyes IMMEDIATELY slide down to TBG’s feet…. and that likely means they don’t carry his size. 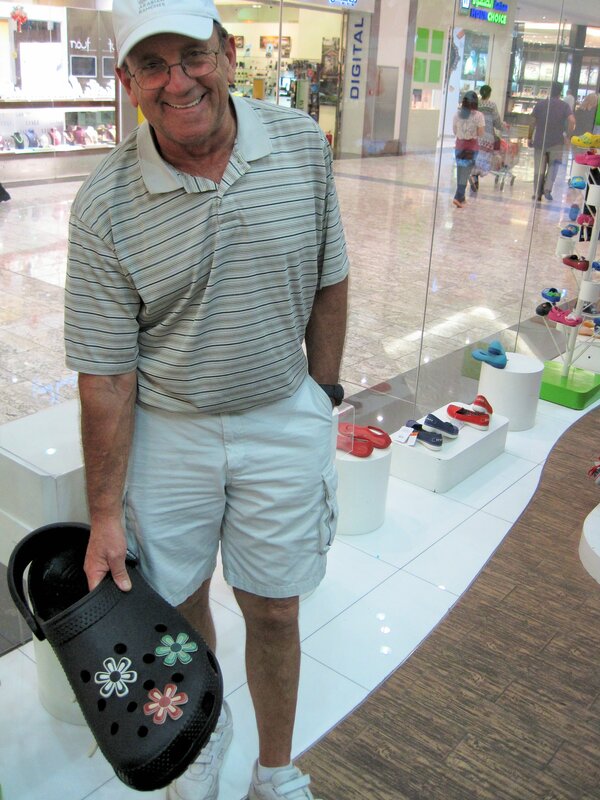 Well, we lucked up on a Crocs shoe store in one of the malls here…. and lo and behold they had Crocs in large sizes!! Take a look!! You are so funny. But good picture of TBG. You make my day. Love ya. J.
He’s been cracking me up, Jeanie. The man is honestly having a ball here. Thanks for hanging around and following…. Any luck finding shoes that size in dubai ?? I’m flying into dubai on sat and need to find black shoes urgently . You reply would be greatly appreciated.